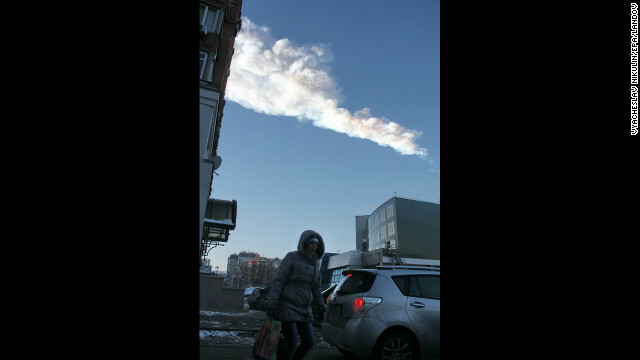 (CNN) -- Twenty-five people were discharged from hospital Friday, state media reported, a week after a meteor exploded in spectacular fashion in the skies above Russia's Urals region, shattering glass in thousands of buildings. 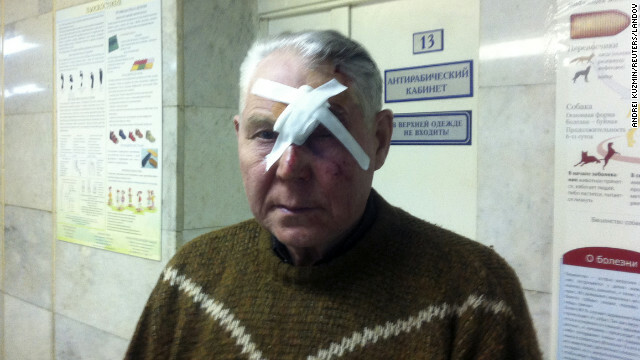 Eleven children were among the patients who went home Friday morning, the state-run RIA Novosti news agency reported. More than 60 people were hospitalized across the region, the local emergencies ministry said. The total count for those hurt climbed in the days after the meteor's arrival on February 15 to more than 1,500, according to RIA Novosti. Most of the injuries were minor and caused by flying glass. 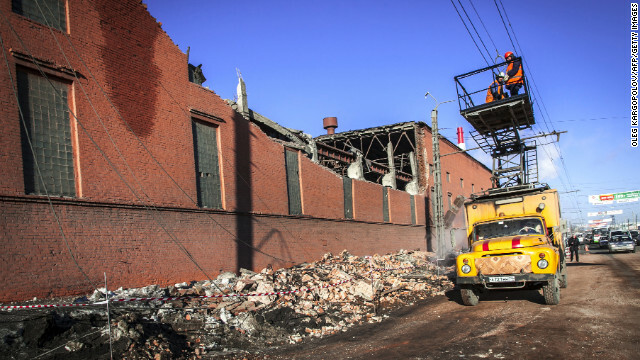 The Chelyabinsk region, the hardest-hit area, asked federal authorities Monday for $16.6 million in aid, RIA Novosti said. 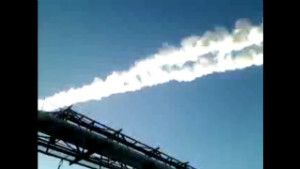 A large chunk of a meteor that exploded over Russia is found in a lake on Friday, February 15. A meteor streaks through the sky before exploding with a flash and boom that shattered glass in buildings and left hundreds of people hurt. Workers repair a damaged power line near the wall of a local zinc plant. About 270 buildings were damaged -- mostly broken glass -- by shock waves caused by the blast, said Vladimir Stepanov of the National Center for Emergency Situations at the Russian Interior Ministry. The meteor leaves a white streak through the sky. The national space agency, Roscosmos, said scientists believed one meteoroid had entered the atmosphere, where it burned and disintegrated into fragments, according to RIA Novosti. The meteor's vapor trail passes over the city. 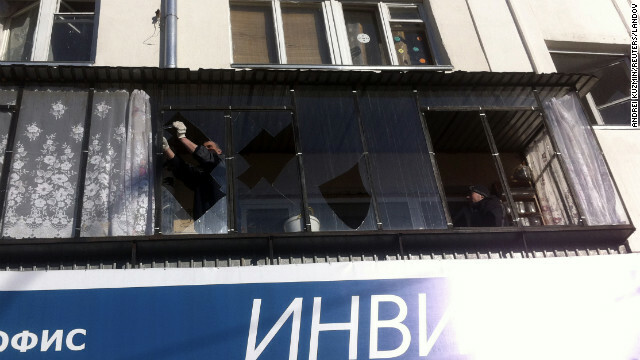 A man removes shards of glass from the frame of a broken window. 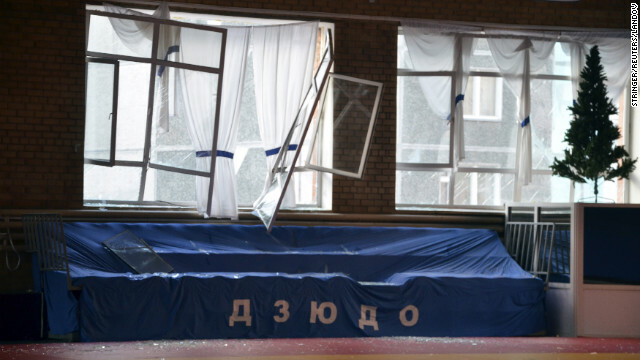 The meteor damaged windows at a sports hall. By noon Russia time more than 725 people had sought medical help. The total bill for the damage is estimated at 1 billion rubles ($33 million), with more than 4,000 buildings affected, many of them apartment blocks. About 200,000 square meters (almost 240,000 square yards) of glass were broken in total, authorities said. Meanwhile, the first fragment of meteorite arrived in Moscow on Friday for analysis, RIA Novosti reported. 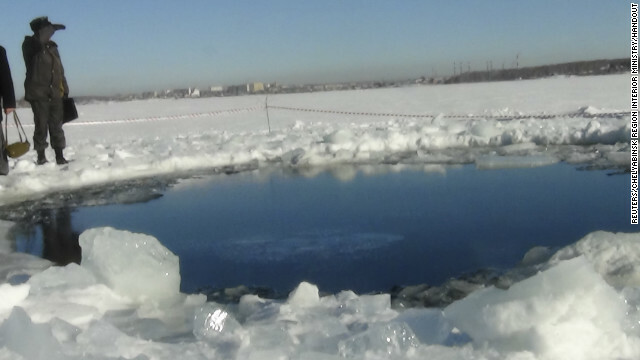 About 50 small fragments have been found so far, the news agency reported earlier this week, some in a crater in the Chelyabinsk region's Lake Chebarkul. Images taken soon after the meteor blast showed a hole in the ice covering the lake where a chunk of meteorite was believed to have fallen. Because the meteor exploded in a huge fireball in the atmosphere, the fragments could be scattered over a huge area. A couple of purported pieces of Chelyabinsk meteorite were advertised for sale on the eBay online auction site Friday. The national space agency, Roscosmos, said scientists believe one meteoroid entered the atmosphere, where it burned and disintegrated into fragments. Amateur video footage showed a bright white streak moving rapidly across the sky before exploding with an even brighter flash and a deafening bang. According to NASA estimates, the meteor measured 55 feet (17 meters) across and had a mass of 10,000 tons. The space agency put the amount of energy released in the meteor's explosion at nearly 500 kilotons. By comparison, the nuclear bomb the United States dropped on Hiroshima in 1945 released an estimated 15 kilotons of energy. The whole event, from the meteor's atmospheric entry to its disintegration in the air above central Russia, took 32.5 seconds, NASA said. Residents told CNN of their shock as they saw, heard and felt the awesome blast, and the chaos and confusion they witnessed in the moments afterward, when no one knew what had happened. Denis Kuznetsov, a 23-year-old historian from Chelyabinsk, told CNN via e-mail of his experience. At first there was a blinding flash lasting several seconds, which made him want to shut his eyes. The light shone "like 10 suns," he said. "This is no exaggeration." Kuznetsov said he experienced what felt like "a push," as a sound wave passed through his body. "For some seconds I simply stood," he said, amid the sound of breaking glass. Interior Minister Vladimir Puchkov told state news agency Itar-Tass this week that he wanted to see scientists develop new technologies that would allow such meteors to be spotted in advance. "I believe that this emergency situation will push us towards generating new resources, approaches and ideas in tackling this serious problem," he is quoted as saying. 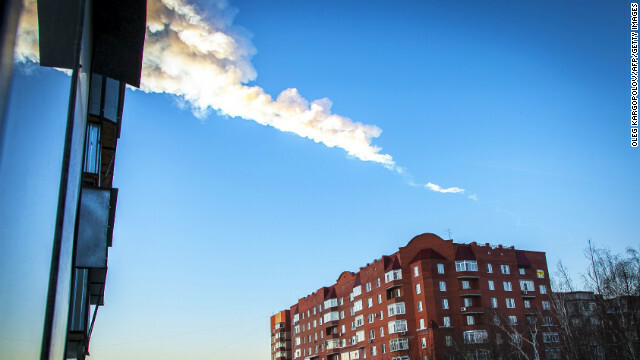 The European Space Agency said that events of the magnitude of the Chelyabinsk meteor blast "are expected once every several of tens to 100 years." 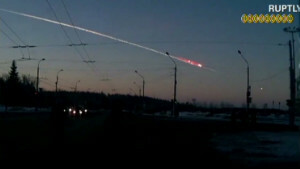 It calculates that the meteoroid burst and disintegrated about 15 to 20 kilometers (nine to 12 miles) above the ground. 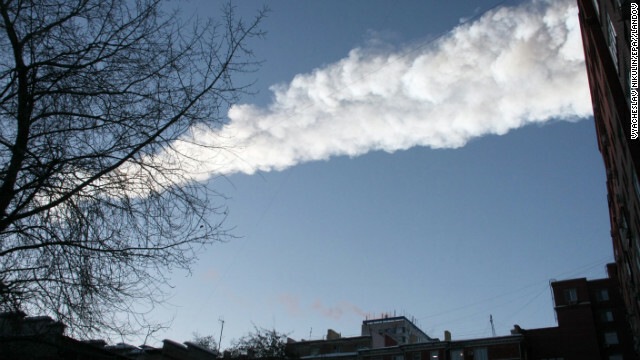 "The terminal part of the explosion probably likely occurred almost directly over Chelyabinsk," said Detlef Koschny, of the European Space Agency. "This was perhaps the single greatest contributor to the blast damage."